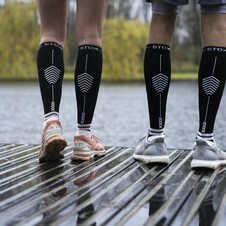 STOX Energy Blog - We should wear compression socks all the time everywhere we go! We should wear compression socks all the time everywhere we go! Of course you want to look good, but first let’s find out why compression socks are so useful. Which is a pretty important aspect, before you put them into your digital shopping chart. Compression socks are socks especially designed for your lower legs. They contain a decreasing pressure drop from the ankle to the knee which results in many benefits. This is how the socks cause a smoother blood circulation. The cells in your muscles get more oxygen, which stimulates blood lactate removal. Actually, you can see the socks as some kind of personal assistent. The socks assist your heart so it has to work less hard to pump the blood through your body. This prevents a lot of discomforts, such as acidification or cramps during exercising and the socks even reduce the risk of injuries. And life without injuries, is pretty good. Sounds interesting, but which one do I need? Of course, we highly recommend not to wear compression socks 24/7, but for instance during exercising or while you’re traveling. Because of the above explained efficiency you will experience lots of benefits from the socks. The waste and carbon dioxide get better removed, so you recover faster after a good exercise. In addition, there is less chance of scarring because the supportive function of the socks reduces the clap of the foot. 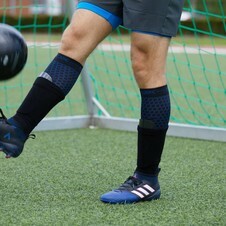 In almost every sport there’s a lot of pressure in the lower legs and that’s why we recommend to use the socks in every different kind of sport. So, thanks to STOX you have less muscle pain, less calf complaints and a decreased risk on tibia injuries. As you can read, a lot of advantages! So compression socks are not only useful for running? No! Even better, the compression socks are useful for many different sports. There are a lot of professional athletes who confirmed the benefits of compressions socks. They even won’t go outside without them. And we’re not only talking about runners. Lower leg injuries also occur in sports like athletics, because the lower legs get twisted and the athlete runs a lot. And don’t forget team sports like hockey or soccer where you are constantly sprinting. You can imagine this causes a lot of ballast in the lower legs. Even as a skater or ice skater, STOX gives you the right support. Aren’t compression socks crazy expensive? Compression socks can be very expensive, but thankfully STOX sells affordable ones. And be honest, isn’t it important to be gentle to our bodies? We think so! That’s the reason sport enthusiasts don't wear cheap plastic shoes. But this is also the reason why a cyclist invests in an expensive bicycle. It’s worth the investment, just like compression socks! Okay, I’m convinced! 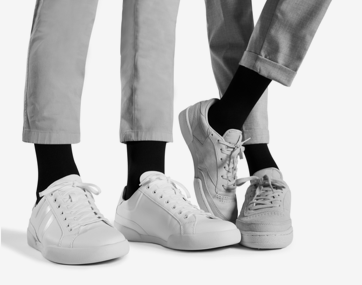 Which socks do I need to buy? There are many different kinds of compression socks. There are medical socks and socks for traveling when you’re for a long period in the same sitting position. But STOX also offers compression socks as a supporting tool for your exercising. For instance when you’re a runner or hockey player. When you like to go skiing during Winter, STOX offers special Skiing socks. The Socks make sure you don’t have to rest after the second day of skiing because of terrible pain in your shins. Thanks to STOX you can enjoy your skiing holiday! Do you feel unbearable pain in your legs right after your workout? Use the recovery socks! > STOX Energy Blog	> We should wear compression socks all the time everywhere we go!